As Torontonians prepare to head to the polls to elect a new mayor and city council, analysis from Vox Pop Labs reveals the patterns of influence among those who Tweet about Toronto politics. Elections are thought to be fought on two fronts, conventionally dubbed the air war — the campaign that takes place via television and radio — and the ground war — the campaign that takes place via party workers going door-to-door in local constituencies. Social media is an emergent third front, a hybrid of broad- and narrowcasting that is at once global and local. The implications of this new front are the subject of much speculation, but social scientists are only beginning to approach the degree of empirical rigour necessary to develop robust theories about the role and influence of social media in election campaigns. Vox Pop Labs is a leader in the analysis of Big Data on public opinion and continues to release innovative research on the influence of social media. The organisation conducted a year-long analysis of Twitter activity based on the use of #TOpoli, the most widely used hashtag in Toronto politics. 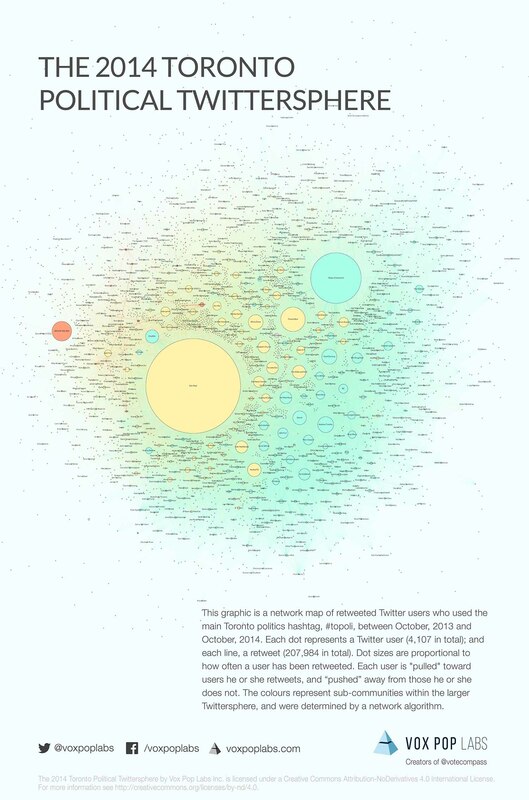 “We visualised these data to reveal the structure of the Toronto political Twitterverse. The visualisation is based on a network algorithm that places users closer to those whom they retweet,” said Gregory Eady, senior data scientist for Vox Pop Labs. The result is a fascinating glimpse into how Toronto politics has played out on Twitter over the course of 2014. Click on the image to view in high resolution (File size: 21.4 MB). The 2014 Toronto Political Twittersphere by Vox Pop Labs is licensed under a Creative Commons Attribution-NoDerivatives 4.0 International License. The Toronto Twitter visualisation differs notably from similar analyses conducted by Vox Pop Labs during the 2014 Ontario and 2013 Quebec provincial election campaigns, where divisions among different groups was more pronounced. The following list identified the top 101 Toronto politics Tweeters on the basis of the number of re-Tweets they received in the last year using the hashtag #TOpoli.